Life can be incredibly stressful – there are no two ways about it. But the main issue is how to stop stress from ruling your life. There are so many blogs out there that give tips on how to reduce stress – but a lot of them focus on calming your world through meditating, yoga and clean eating. And that does work for some people, and it can be a really beneficial way of relieving stress – but it isn’t for everybody. Sometimes the best way to shake off stress is to scream about it or to go base jumping. A lot of stress works its way into our lives in the form of pent-up emotion, whether that’s anger, sadness, or even giddiness. And the former two can really bring you down, making you feel worn out, ill-tempered, and even aggressive. And one of the best ways to deal with pent-up aggression is through physical exertion. One trick therapists use to help people with anger management issues, is to tack up a sport like boxing. Where you have to focus that energy into an activity, and where you have to be focused and disciplined enough to avoid injury to yourself and others. Here are some high-energy or alternative ways of getting rid of your stress. Connect with the adrenaline junkie with you. 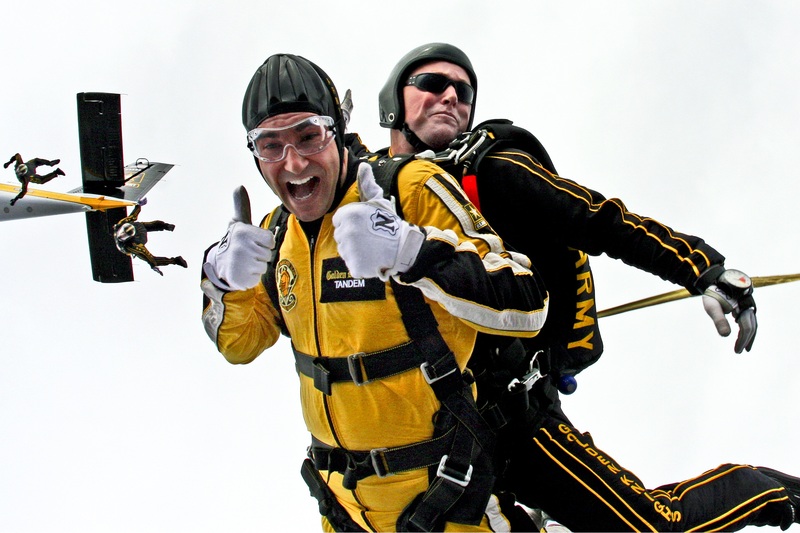 Going base jumping, skydiving or bungee jumping are all ways of getting that adrenaline pumping. The natural endorphins released by physical activity still occur when you are throwing yourself off a cliff, and the experience will be extreme enough that you won’t be thinking about tomorrow’s meeting or presentation while you are plummeting to the ground. If you are going to be taking part in any activity like these, then make sure you’re doing it with a licensed company. All high-intensity sports have the same effect as the above, just for a prolonged amount of time. Where a bungee jump might last for an hour – including the talk and gearing up – a sport can take all day. Some ideas would be rapid kayaking, free-climbing and hang-gliding. Even slightly calmer sports like ones including paddle boards, offer the same level of concentration. And the more experienced you get, the more extreme you can take the waves. These prolonged times of intense activity gives you no room to think about anything else, and can actually help boost thought processes and creativity. You might just need a good round in the gym, or a run or bike ride. There are plenty of stress-busting workouts out there that are proven to deal with all the pent-up frustration you keep bottled up. You might want to look into a full body workout, and, like we said; sometimes you just need to hit something – boxercise would be a good option. You might find that you need to not think about what you need to do next, in which case, hiring a personal trainer can really push you to the limits without you getting sidetracked by next week’s deadlines. Gaming consoles have become an integral part of most people’s homes – especially millennials. With over 50% of millennials owning a gaming console, and many owning more than one. Gaming can be a good stress-buster, as it allows the gamer to become immersed in a different world where the worries of real life don’t matter. It’s like reading a really good book, except it’s you shooting the mob boss in the head, or you scoring that impossible goal, and not the character. This entry was posted in Fitness/Wellness, Other and tagged Adventure Sports, Base Jumping, bungee jumping, dancing, exercise and fitness, Extreme Sports, fitness blogs, gaming, health and fitness, Meditation, paddle boarding, rapid kayaking, skydiving, sports and fitness, Sports Archives, Sports Blogs, stress reduction, yoga. Bookmark the permalink.